Foto Friday XCVI – ..:: NJ Brideau ::..
What are you looking at this week? I’ll let you guess, but I think it should be fairly obvious. I’ll give you some hints. I spent the past weekend away from Oxford, and this is probably the most touristy place in Europe. Any ideas? 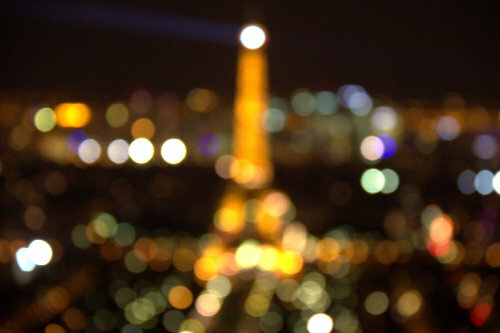 How about an out of focus version of La Tour Eiffel? I was fortunate enough to enjoy the panoramic views from Montparnasse at sunset, so I got to see Paris both by day and lit up at night. Some of you will know that one of my favorite activities in a new city is to see it from high above, and I would argue that this is the best spot in Paris. 1/3s f/5.6 110mm ISO 400. Brightness adjusted. Au revoir until next week.